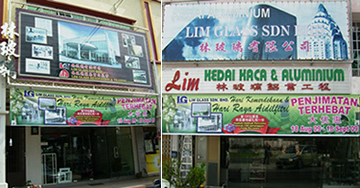 Aluminium & Glass Renovation Malaysia Johor | Lim Glass Sdn. Bhd. Office: 5, Jalan Kota 6, Taman Kota,83700 Yong Peng. Showroom: 12, Jalan Sutera, Taman Sutera, 83700 Yong Peng. 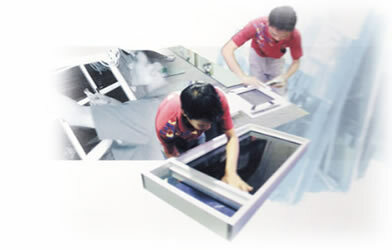 Lim Glass Sdn Bhd has been established for 15 years in Malaysia. Our management and employees have had many years experience in aluminium manufacturing and glazing. Over 500 installation projects that have been completed with various major contractors and projects management teams. Our main line of business is manufacturing of aluminium products including shopfronts, doors, windows, etc. In addition to manufacturing we also do maintenance to existing aluminium installations, glazing and cleaning of aluminium fasades. High Quality , Exellent and Positive Service With Reasonable Rates. A dedicated team of skilled professionals, full fledged technical department with computerized designing & drawing with a well equipped most modern fabrication division enable us to extend best quality service to our clients.